- Finishing is simple but can't argue for the price point. At Baselworld 2016, Seiko announced some exciting editions to the Presage Collection. The two timepieces that had people talking were the 60th Anniversary Automatic Chronograph Limited Edition Chronographs with a choice of enamel or lacquer dial. Certain models with enamel and lacquered dials have only been available for the Japanese market previously. We take a closer look at the Urushi lacquered version. Previously the only way for collectors to obtain a limited edition Presage model with an Enamel or Urushi dial was to obtain one while they were visiting Japan. It is nice to see these limited edition pieces are now available worldwide. The Seiko Presage 60th Anniversary Automatic Limited Edition Chronographs got us excited when we saw the press release and when we saw them in Basel, we were impressed with what was being offered for the price. The Urushi lacquered version immediately catches the eye with its midnight black dial, which provides a nice contrast against the 42mm stainless steel case. The stainless steel case has been polished overall and the lugs have a slight curve to them. The bezel has two layers to it which provides depth to the case. All of the markings on the dial from the Arabic hour numerals, the chronograph sub dials and the minute track are silver which blends nicely with the black lacquered dial. The running seconds is located at the 3 o’clock position, the 12 hour counter at the 6 o’clock position and the 30 minute counter at the 9 0’clock position. The black coloured date disc is located between 4 and 5 o’clock. In our opinion the date could have been left out which would have given the chronograph a slightly cleaner look but it is able to blend in without drawing attention. 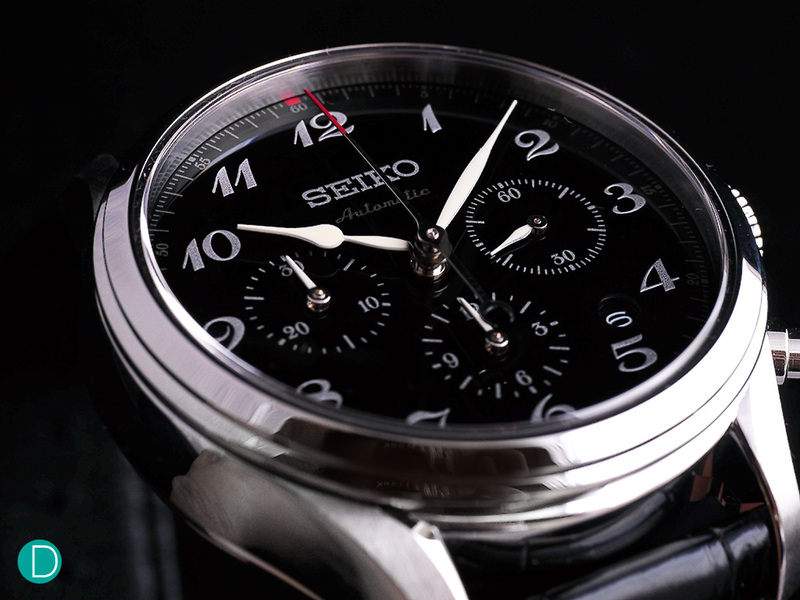 Seiko have used white hands for all of the sub dials and the hour and minute hands to provide a contrasting effect. 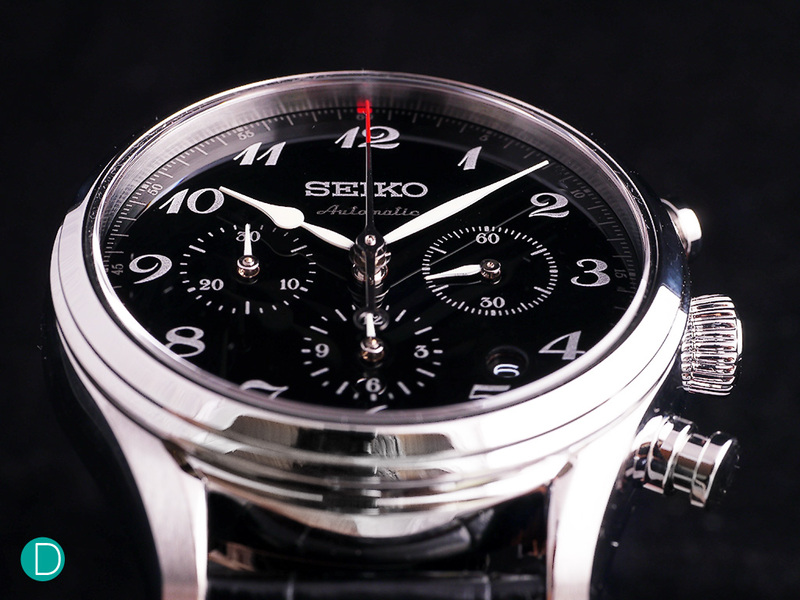 The chronograph seconds hand is silver with a red accented tip to add a dash of brightness. At the 60 minute mark on the minute track there is an additional touch of red. What makes the dial special is the process it goes through to achieves its darkness. Using sap from Japanese lacquer trees, it is applied a layer at a time then hand polished. This is done multiple times to achieve its final finish. This is done under the watchful eye of Mr Isshu Tamura who is a master of the art of Urushi lacquer techniques. The dial will darken as the years pass by. 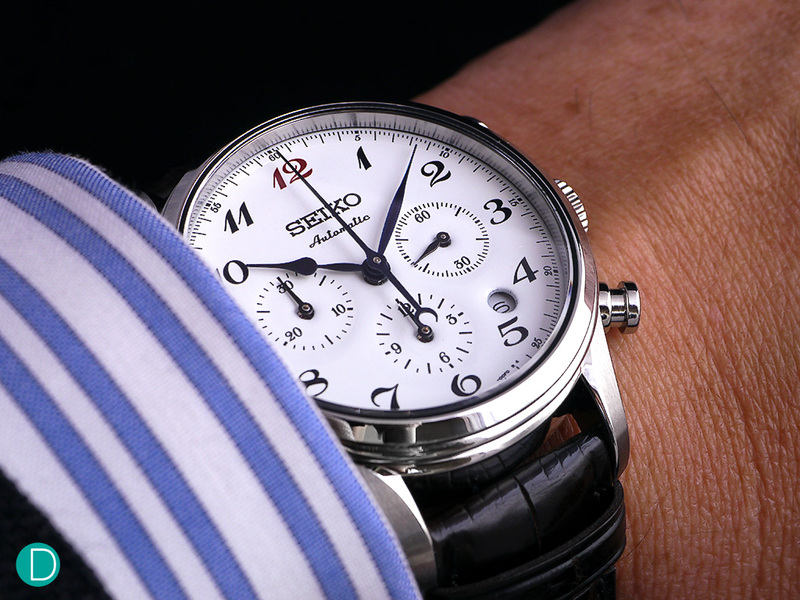 For those who would prefer a lighter dial, the white enamel dial looks equally as good. 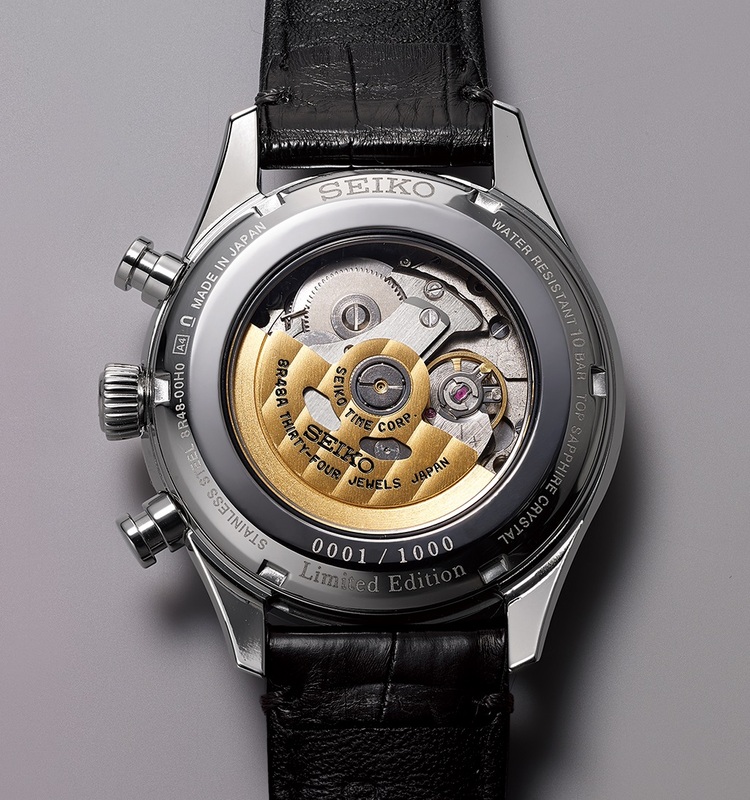 Powering the Seiko Presage 60th Anniversary Automatic Chronograph is the in-house 8R48 caliber. 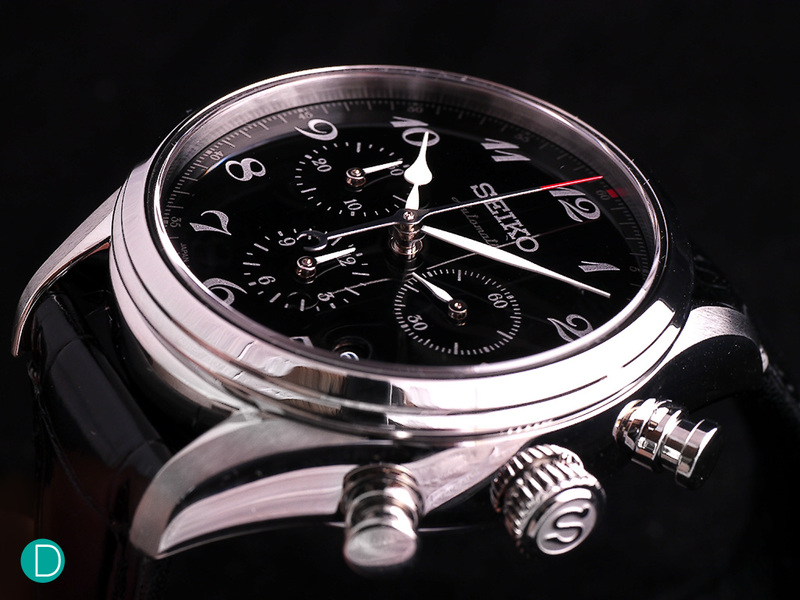 It features a vertical clutch and column wheel for the chronograph. Now it isn’t finished to the highest standards but at least it has some striping on the gold rotor. It has a power reserve of approx 45 hours which is more than reasonable. We have a feeling new owners will not want to take the watch off. For €2,800 you would be hard pressed to find a similar watch with an in-house chronograph and intricately made dial. The Seiko Presage 60th Anniversary Automatic Limited Edition Chronograph with Urushi Lacquer dial offers real value for money. We are definitely impressed by what is offered for under €3000, from the hand finished lacquer dial to a fully in-house chronograph movement. As we mentioned earlier the movement finishing isn’t spectacular but is in line with the price point. Both the Enamel and Urushi versions are limited to 1000 units each & with the attention the watches got at Baselworld, if you are interested, our advice would be to place your order quickly!